Online strategies are most successful when they accompany creative, on-the-ground strategies. Start Strong sites, with the help of creative youth leaders, used the best of marketing techniques to catch young teens’ attention, win their loyalty, and make their messages memorable. Think flash mobs, swag, poetry slams, battles of the bands, chalk art and more—the creative sky is your limit when it comes to on-the-ground marketing. Start Strong Wichita created a battle of the bands event where youth performed songs they had written about healthy relationship themes. They used their website to let the public vote on the best songs and download original music by the bands, pictures and video of the event. They encouraged social media promotion of the event by the competing bands and used traditional marketing such as posters, announcements at school, t-shirts and giveaways before, during and after the event. Start Strong Wichita also enlisted high school students to perform The Outrage, an original play designed to educate students about teen dating violence at middle schools in the area. They engaged the play’s writer and director Allison Basinger, who led all cast members in over 10 hours of intensive teen dating violence training before they even began work on the play. After each performance, the high school cast members opened the floor up for questions from their middle school audiences—encouraging kids to express the emotions and questions that the play raised for them. Start Strong Idaho launched the ChalkHeart Challenge (“Color Relationships with Respect”), consisting of 30 teams of teenage artists at the Boise Art Museum sketching chalk interpretations of winning relationship poems written by fellow students. The event even received coverage in the New York Times! The site also held a “The Power of Words” Poetry Slam event, where over 450 teens and parents participated. Start Strong Bridgeport developed a comprehensive, catchy brand for their program, which they named MYO (Mine, Yours, Ours). To make their brand cool and widely visible, they equipped older teens with branded materials, which they gave out to middle schoolers. 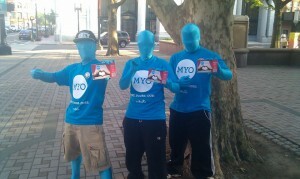 They even created a campaign “mascot” called MYOMan, who wore a blue spandex suit at events and on campuses. Start Strong Bridgeport found that first getting kids excited about the fun and cool aspects of their campaign made them more likely to stay engaged with the more serious and educational aspects of it later.